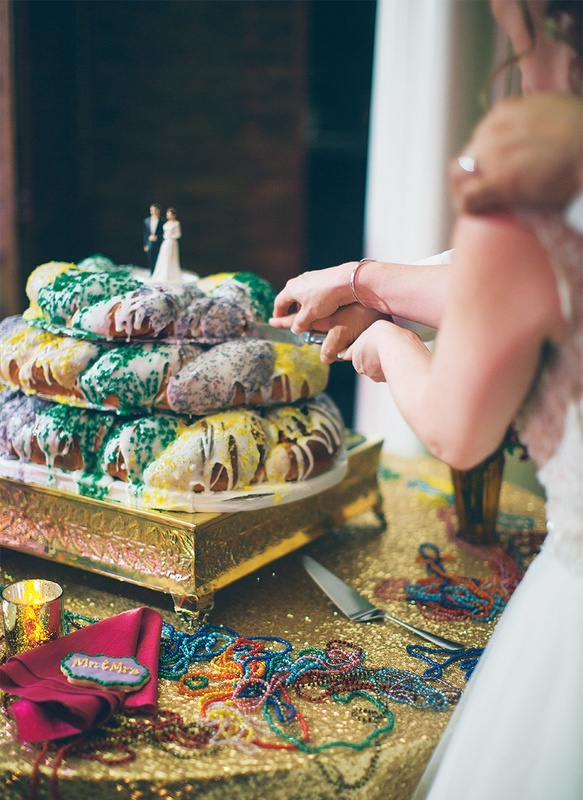 Whim Events plans a colorful celebration brimming with nods to a Louisiana tradition. 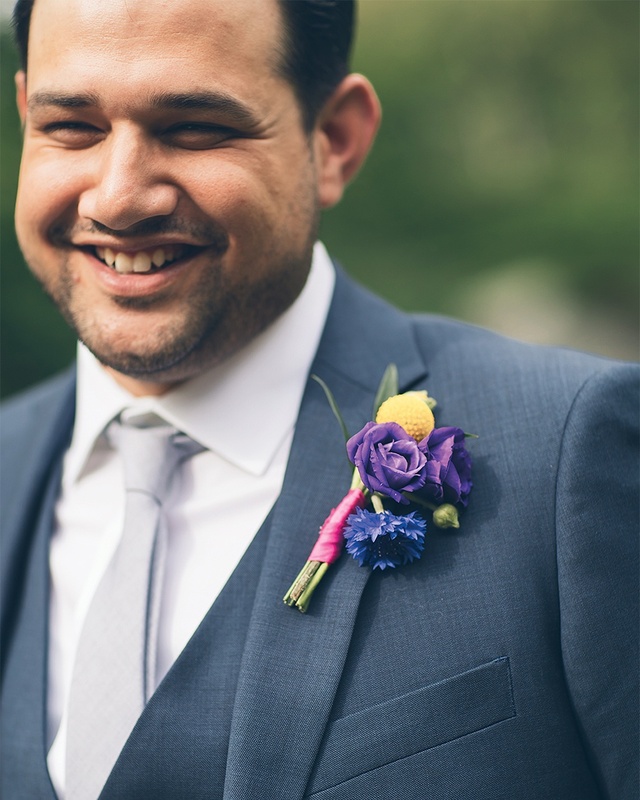 By Jenna Pelletier·	 12/11/2018, 9:00 a.m.
A native Louisianian, Michael Basu has been going to Mardi Gras his entire life. So it wasn’t long into his courtship with Lori Manzelli before he started inviting her to fly to New Orleans with him to partake in the festivities. 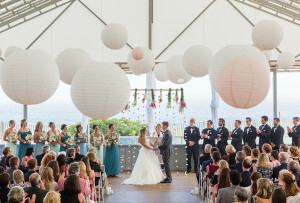 A couple of years later, he proposed there with a plastic light-up ring he caught off a float. “I wore that thing for a full month,” says Lori, who eventually picked out a more conventional sparkler from Boston’s Brilliant Earth. 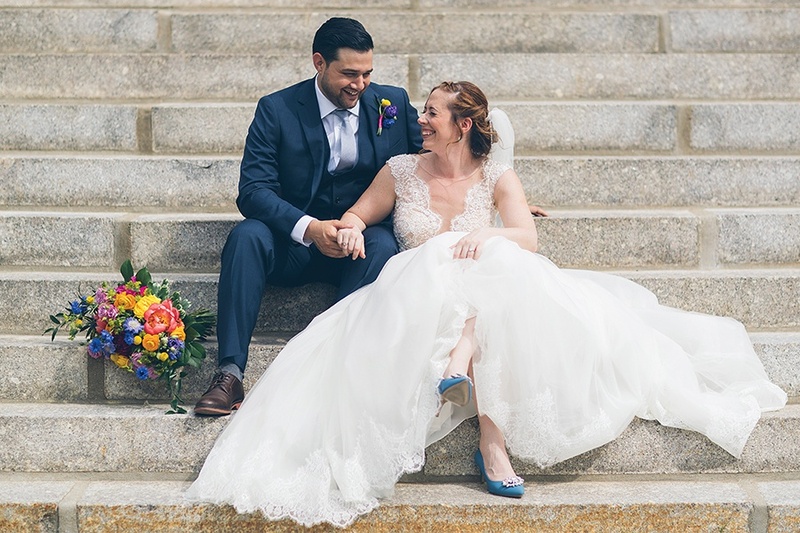 Not surprisingly, the Somerville couple immediately zeroed in on Mardi Gras as a theme for their June 2018 wedding. 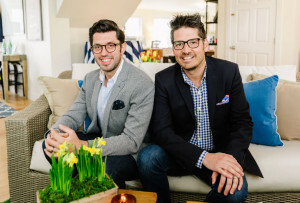 “It was a big part of our story, and we both just love that fun vibe,” Michael says. 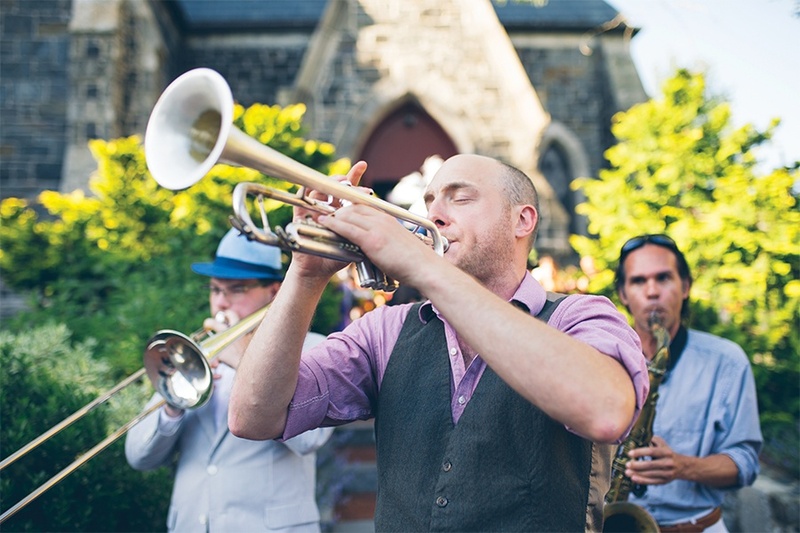 With help from planner Whim Events, they transformed Lori’s former place of work, the José Mateo Ballet Theatre, in Cambridge, into a setting worthy of a Big Easy–inspired bash. Lori’s number one rule? No blush, cream, or white. 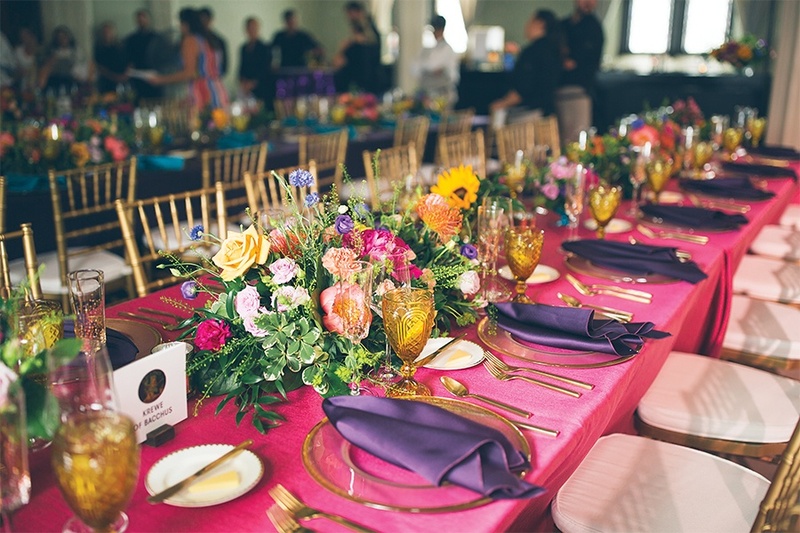 Instead, they chose a colorful palette of magenta, turquoise, and royal purple for their flowers, table settings, and other accoutrements. 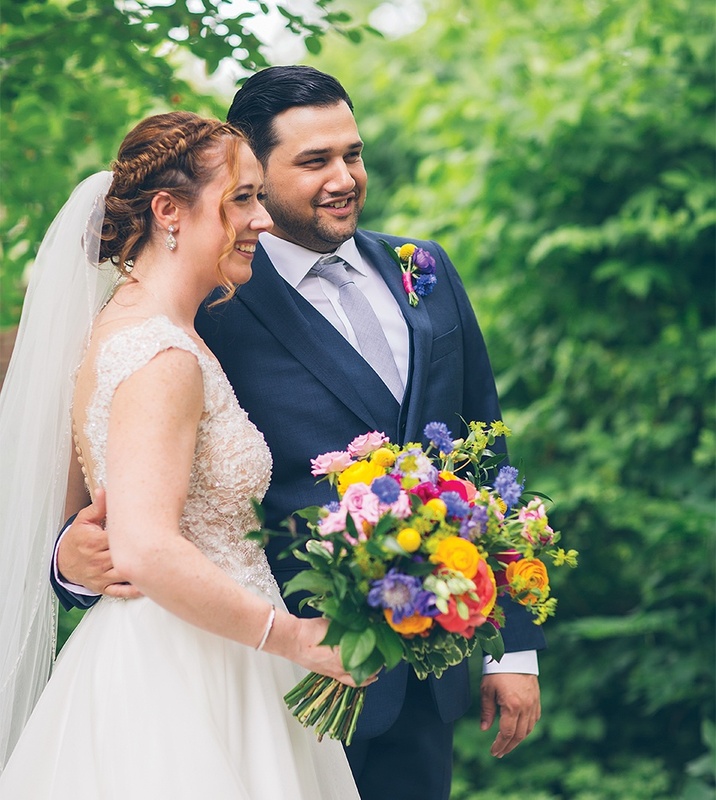 To honor his father’s Hindu faith, Michael exchanged flower garlands with Lori during the ceremony. The couple wore them outside as the Late Risers led them in joyous procession to the cocktail hour. 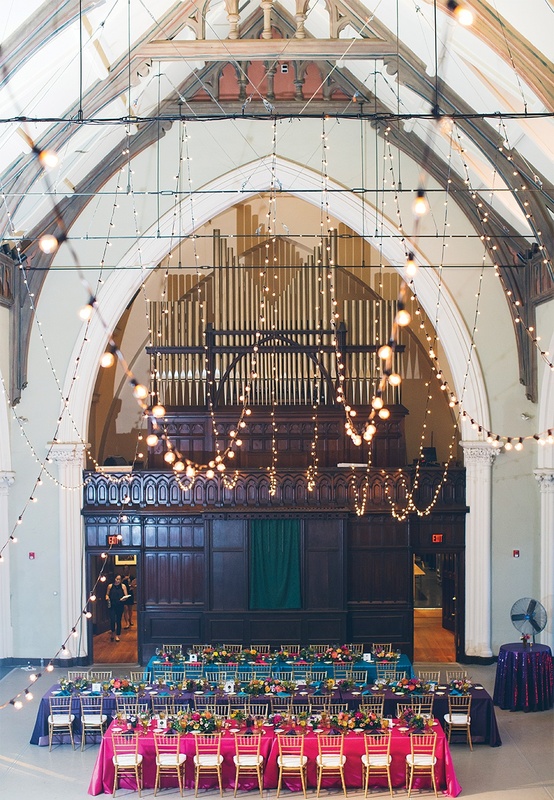 Home to the José Mateo Ballet Theatre, the Old Cambridge Baptist Church set the scene for the reception with its stunning 50-foot ceiling. 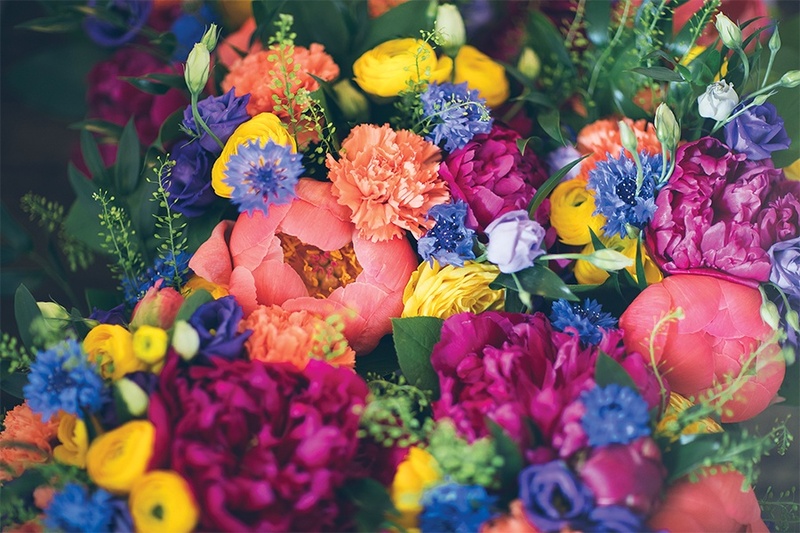 Lori visited a flower market with one of her event planners, Moira Thompson, to help pick out the vibrant blooms used at the wedding. The best part of the day? 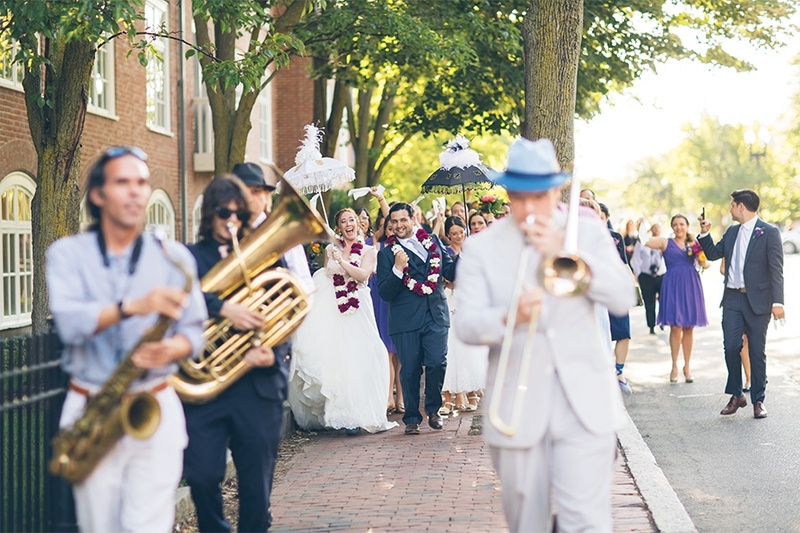 “Getting married was obviously our favorite part, but the second-line parade with the Late Risers band was right up there,” Lori says. A pro behind the camera himself, Michael was in charge of choosing the couple’s photographer, Erin Chapman. 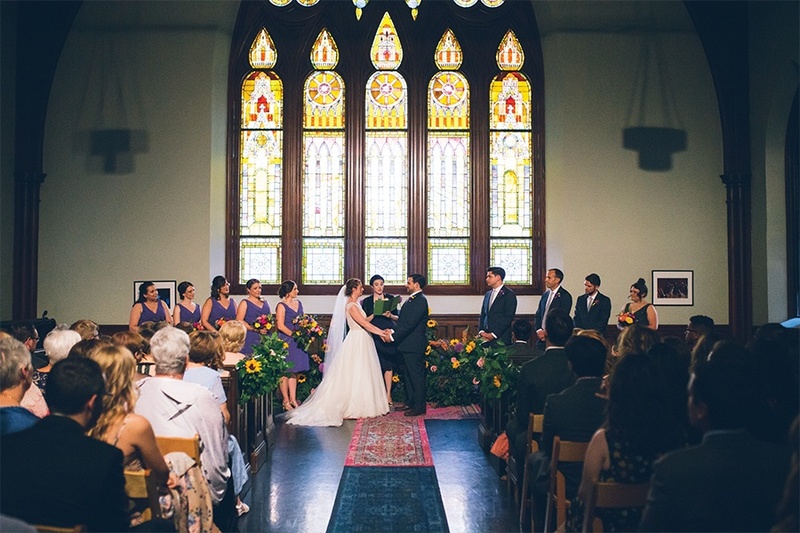 A restored Tiffany window provided a beautiful backdrop for the couple’s vow exchange. 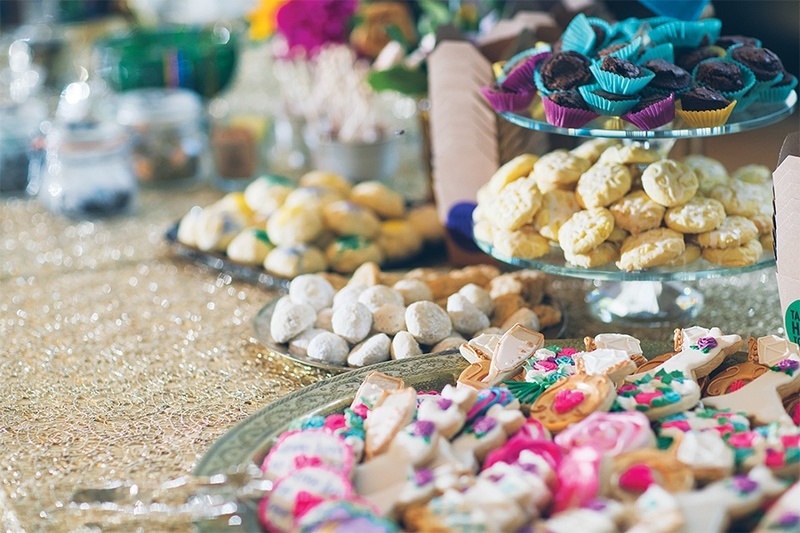 Michael and Lori invited guests to bring their own baked goods to add to an overflowing cookie-table display. Michael proposed to Lori at a Mardi Gras parade, which inspired the wedding’s theme. 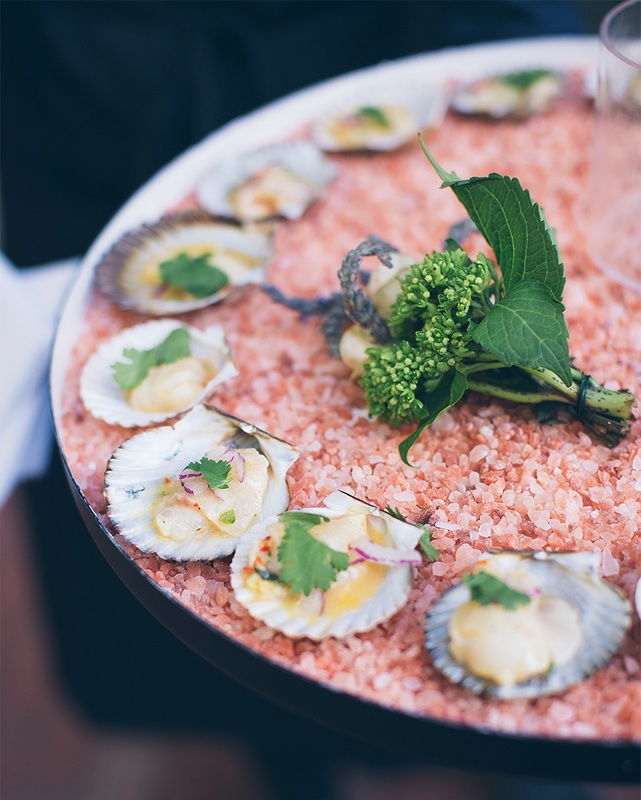 Caterer Kate’s Table incorporated elements of New England, Cajun, and Indian cuisines into the meal. After a long search, Michael and Lori finally found a Massachusetts baker willing to whip up a king cake at Sally Ann Food Shop. 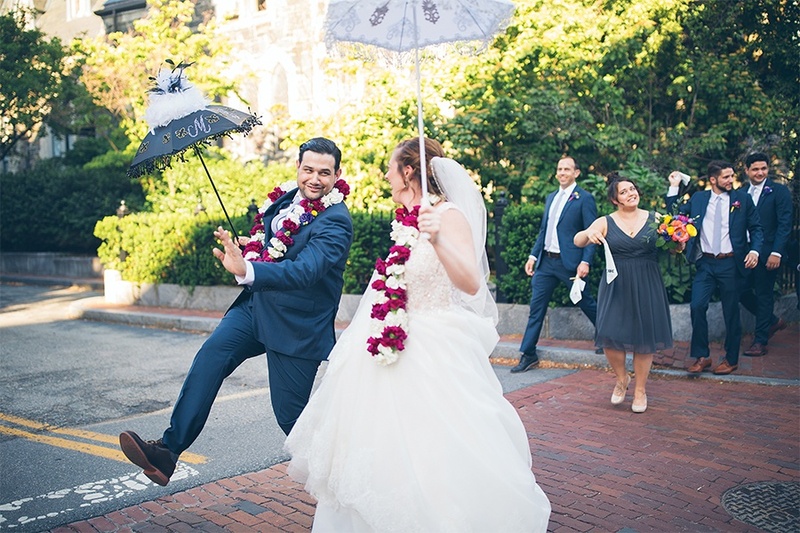 With their venue right in Harvard Square, the couple took advantage of the historical buildings on Harvard’s campus for photo backdrops. 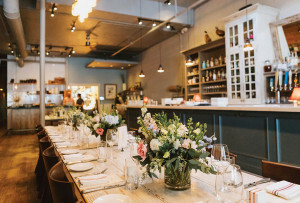 Instead of numbering each table, Michael and Lori named them after Mardi Gras parade “krewes,” the term for the clubs that organize the festival’s parades. 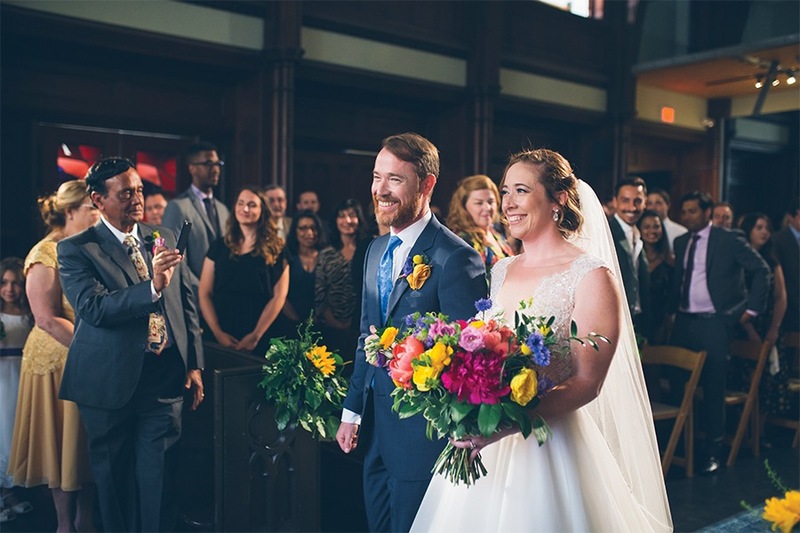 In contrast to the event’s whimsical elements, Lori opted to wear a traditional gown and veil as her brother, Paul, walked her down the aisle. 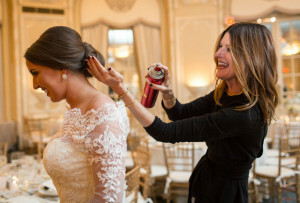 Hair and Makeup Hair by Christine & Co.